Hello, this is EMG | KirbyKaze. I wanted to take a moment to talk about teams because I feel it's a misunderstood part of the game. More specifically, it is my opinion that there are a lot of misconceptions surrounding it that have become accepted as facts and it is my intention to undo the ones I can. This is also in response to the recent criticisms aimed at teams as of late. In the last few months, Wife and other members of the community have expressed some controversial opinions of teams. Namely that it's difficult to commentate, basically a cash grab for top players, and possibly a hindrance to SSBM's development as an E-sport. My argument to these criticisms is that teams has never been given a fair chance, despite how long it's been around. At almost every tournament I attend, I unfailingly find new players who want to learn this mode of SSBM but lack direction. And as I return home from SUPER SWEET, I have never been more confident in this. I firmly believe there is an untapped market for teams. Enough to write about it. So, how do we go about tapping this untapped well? And why is it so hard to learn teams? In truth, a better question would be, "When has anything ever been done to make teams accessible?" Because that's all that needs to be said -- in fact, nobody should be surprised that teams is such a daunting thing to learn because despite being part of SSBM's competitive canon since its beginning, SSBM teams also boasts the least amount of learning materials available for it. There are more Kirby guides than teams guides. There are more materials for learning how to swallowcide than there are for teaching basic teams strategy. And this is despite Isai being one of the most prominent figures in SSBM's early history. Virtually everything we have focuses on technique execution or character matchups in singles. No wonder so many people give up -- they all have to learn from scratch!! In the last year, some progress was made on this front. In particular, PPU and MacD spoke up for teams and attempted to educate by relating their own experiences into strategies. This was a good start, but the weakness of these materials is that they are written in a manner that primarily highlights and emphasizes the micro-game interactions -- which they've developed from long term partnerships and huge pool of experience. My goal here is simple enough. I want to teach beginners the basics of SSBM teams as of now with the disclaimer that there will be exceptions to the patterns, principles, and strategies I outline in this document. That said, I still believe that learning the contents of this guide and finding the exceptional cases by playing & keeping an eye open for them is a very effective way to build your own understanding of teams. Therefore, you should understand that the contents of this guide are guidelines -- meant to teach you about situations that occur in teams, the forces that shape these situations, and the subsequent teams interactions that follow. They are NOT a substitute for experience, situational awareness, or in-the-moment intuition. In fact, as you get better, I fully expect more sophisticated plays to be made -- especially if you have a long term teammate that you're building strategies with. I'd like to also make note that I believe teams is probably the most underdeveloped mode of SSBM competition. Largely because it's never been approached in this manner, unlike every other aspect of the game. If this guide is successful in generating strategic dialogues about this mode, I fully expect the contents of this guide to become obsoleted as the plans of different compositions evolve and the metagame changes. But for beginners today, these are the things I've noticed. I hope they can help you. So, without further adieu, let's get cracking. When we talk about teamwork in SSBM, it's hard to have that dialogue without Wombo Combo. Partially because of how viral is went, but also because it's a shining example of how efficiently a team in sync can dispatch an opponent. However, the Wombo Combo is special for more than just its climactic ending. Though this part is not talked about, the manner in which it was set up is also a demonstration of one of the major ways a team can achieve positional advantage in teams and play in a cohesive manner. What do I mean by "a cohesive manner"? I mean all the work that SS and Tang put in leading up to that infamous hit sequence is done in a manner that demonstrates they both know their roles on the team and place themselves in relation to Zhu and each other in a way that both threatens Zhu but also keeps them from getting in the way of one another. In his article on the subject, Mow explains that a good way to learn about positional advantage in teams is to understand the opponent's roles. He suggests labeling opponents as "aggressor" and "supporter" based on what characters they are playing (ex. Fox & Falcon are often aggressors, Sheik & Peach are often supporters) and also taking into consideration how those characters' pilots play the character (eg. Falcon and Fox are both commonly aggressors, but when a Falcon's on a Fox team, the Falcon is often the supporter due to Fox having more effective close up tools and due to Falcon's ability to cherry-pick opponents at low percent with his high impact KO moves if an opening for one is created by his teammate). This was one of the most helpful things that I learned when Jethrotex and I began teaming steadily because it helped us structure how we were going to address our opponents. It helped give order to what was going on in a match and made patterns easier to observe. And I still use this method of sorting opponents as I've gotten better at teams (though I've still got a long way to go). 5) SS has enough room to nair in place to put pressure on Zhu (to provoke a reaction). Tang also has enough room to do this with his ground pokes (f-tilt / d-tilt) and SH aerials. They have enough distance to put pressure on Zhu without getting in the way of each other. When we break this situation down like that, and understand the attention to detail that went into how SS & Tang set up that legendary hit sequence, the prep work is almost as impressive as the end result. Sandwich, anyone? It's clear there are many benefits to be gained from proper team positioning -- Tang and SS were able to create a situation that allowed them to protect one another & attack Zhu without putting their teammate at risk. But how do you decide who attacks who? And when do we go for assists? To this, we must turn to further investigation. (1) - When you have an opponent occupied, you are protecting your teammate from that player. (2) - Abandoning whoever you're occupying can put your whole team at risk. (3) - A strong position lets you occupy at least one opponent while providing room to help your teammate. The basic idea that Mow pointed out in this instance is that Hax, being the more aggressive player between himself and Hungrybox, has been isolated by PP and Yayhuzz in a position where he's effectively stuck between two technical space animals as Captain Falcon (and therefore liable to die). 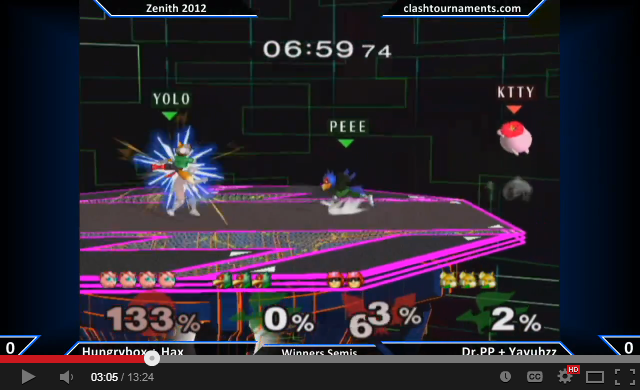 Yay and PP have also isolated HBox from Hax by keeping him confined to the edge. This means HBox's biggest strengths as a supporter (namely resting off stray hits & the ability to save a recovering teammate) have been severely hindered because they require an interaction between himself and his partner in order for them to work. PP and Yayhuzz's position effectively prevents Hax and HBox from being able to solve their current situation using teamwork, while PP and Yayhuzz have no such handicap. 1) Yayhuzz is closer to Hax than PP so a good amount of his attention will be directed towards keeping the Falcon contained & incapacitated as he looks for a way to set up a kill on him. Though Fox and Falco likely could get a kill on HBox if they worked together on it, Yayhuzz recognizes this is a poor course of action because (a) PP is dealing with him effectively in his position and (b) pursuing HBox would mean abandoning Hax, which would give Falcon an opportunity to attack them, which can put both Yay and his teammate in danger -- the risk is not worth it. 2) PP understands his attention in this position is going to be split between keeping HBox contained while supporting Yayhuzz when he needs it. By being in between HBox and Hax like this, he's in the ideal position for batting away HBox if HBox engages him. And all the while he's retaining the ability to cover the space behind Yayhuzz if Hax attempts to escape his position by rolling there or DIing one of Yay's air combos there. 3) Because PP is the player between Hax & HBox's characters, instead of Yayhuzz, the character with the fastest & most effective approach on PP's team (Fox) is not isolated and therefore Yayhuzz is in a position where he can assist his teammate if HBox successfully recovers onto the stage and gains the upper hand vs PP (which is important to stopping u-throw rests and such from resolving). This position is so good for the spacies team, and so crippling to the options of its opponents, that there is almost no reason that could justify the spacies abandoning it aside from, "Someone on the other team outplayed us and we can't hold the position anymore." At its core, even in teams, SSBM is ultimately a game won by options. When you achieve a stronger position than your opponent(s), your options are innately better than theirs. Which means a strong position will facilitate better opportunities for teamwork to occur -- this does not work the other way around with nearly the same effectiveness. A common misconception to players unfamiliar with teams is believing that making assists is more valuable than maintaining strong position. This is a common mentality when players strong in singles attempt to cross over, because of the short term reward of making a save or finishing a lethal team combo. But this is poor strategy and we can recognize this by simply referring back to PP and Yayhuzz. If Yayhuzz abandons Hax to assist PP with a combo on Puff, Hax becomes capable of attacking while they're attending to HBox and has a decent shot of killing one or both of them. If PP abandons his role guarding HBox and/or policing the back of Hax's retreat zone, then Hax & HBox are liable to reunite and become capable of working as a cohesive unit. 1) Even if Riddlebox hit Raynex to pop him up, both DJ Nintendo and sauc3 were already in the positions they needed to effectively edgeguard both of them (sauc3 was hovering in the air-space where the umbrella would have likely sent Raynex, DJ was onstage near the edge close enough to grab it and drop for invulnerable shines & ledgehop bairs). 2) When Riddlebox goes for this save, because of the nearby Fox (with access to ledge invulnerability) he's likely to die in the attempt. This means the best he can realistically hope for is trading his stock to save Raynex's, which does not actually result in a net gain of stocks. 3) Peach was not at risk for being grab-rested or grab-smashed by the opposing team if she waited for Raynex. Puff was recovering from a low altitude as a result of how she killed Fox, removing the threat of a 2v1 during Raynex's respawn. 4) Because both Riddlebox and Raynex died, rather than just one of them, they were forced into a 2v1 against a low percent Fox and a rest-happy Jigglypuff. Attempting that save was likely the moment where the match's outcome was decided. And it's a common type of mistake in teams. Though the immediate reward of the assist can be tempting, it is important to weigh the benefits of attempting it against what you're giving up. Had Riddlebox done that, he would have realized that waiting for Raynex to respawn was a much safer route to victory than attempting to save him. When playing in teams, understanding the value of a high impact assist is an important part of in-match decision-making. Though the potential to maintain a stock or finish one can be enticing, it is important to also consider how the opponent(s) can respond to this too. Generally speaking: taking damage in exchange for a stock is profitable, trading your stock for one of their stocks can be profitable, and putting both members of your team in danger for anything is rarely worthwhile at all. Thus concludes the first installment in this series; I hope you enjoyed it as much as I enjoyed writing it and I hope everything in it made sense. Future installments will likely cover some of the basic rules that I have found help me and my partner from bumping into each other in a bit more detail and some other basic mistakes in coordination (and how to avoid them). Feedback is of course welcomed too if you have suggestions for future topics or simply want to leave a comment / criticism. Great installment! one of your installments should be 2v1 situations when you are the "1" in the 2v1. If that's what people are interested in, I can definitely explore that. You said you could write a book on Tech Chasing in your last interview, could you please do a write up on that sometime in the near or far future; or are there already some great posts on smashboards you made about it? Hey KK! Great article, I recently played in doubles at a small tourney and did fairly well just staying away from my partner and gimping enemies. I found that if I set up the sheik for a gimp the fox would wait for me on the edge, allowing either me or my partner to get at them. In the end I was able to take a stock off of each of them at sub-10% before flubbing my recovery. So the questions I have from this experience are A) How can I deal with my partner being Gimped? and B) What's a good way to practice saving your partner? Thanks for putting in your two cents on the doubles meta game, and for being a part of the community! Wow, that was a good first installment. I'm new to the whole community and I had no idea there could be this much more depth in teams compared to singles in aspects such as your position relative to your teammate relative to the opponents.